June 2008 – Are my eyes really blue? And pot smoke is somehow magically better than all other forms of burnt particulate manner…how exactly? Why isn’t it legal to shoot hippies for cognitive dissonance? …except that it was essentially a draw. The ceiling is officially lifted on what I am prepared to believe about Clinton Portis. Seriously, this guy is your #1 entertainment value in a league that is proverbially bereft of entertainment value. As long as Portis is slowly slipping into insanity in the full view of the public, you can no longer call it the No Fun League. I never thought this would happen to me…but I have found that I really do like getting to work earlier than everyone else. If I can walk in with my coffee at 7:45, knowing that nobody will come in or call for at least an hour or more, and I’m able to work through my email, change the tapes on the backup servers, and generally ease into the workday – everything goes so much better. I don’t really have set coverage hours here, but I have sort of chiseled out the standard 8-5 (by the way, the cliche is “9 to 5”, how on earth did we end up with 8-5? Somebody wanna explain this?) and found that the best hour of the day is the first one. I think the coffee helps. In the interest of saving money and helping force me up in the morning, I’m trying to grind my own beans again. Whole Peruvian beans from the farmer’s market (roasted on Saturday, no less, they’ve just finished oiling out to the point I can start using them tomorrow), a grinder and a French Press (or the little one-cup filter-drip unit the wife put me onto) – and if I can get 15 minutes before leaving, I can leave with a full thermos bottle and maybe another mug besides. Whether I should drink quite that much coffee in a day is another matter. Back in the day, a cup of coffee was 8 oz – now there are some places whose large coffee is triple that size. And I know the coffee’s more potent now than it was back in the day when it was half Sanka, half sawdust. I know it’s still a while until college football starts, but I am seriously fighting the urge to go out and buy a pile of Vanderbilt stuff (water bottle, valve caps, foam rubber sword, visor, etc etc). I think I may be back on the “grasp for Vandy to be my official alma mater” tip. I won’t go on endlessly about that again, but suffice to say that if you had a choice between Vanderbilt and Actual Alma Mater, you’d grasp too. BTW, that little Nokia 1112 has been on continuously for almost 3 days now and still shows a full 5 bars of battery life. I am now committed to using this until the battery dies, and at this rate, I may not go back to the iPhone before the new firmware comes out. When OPEC first embargoed oil to help pay for the Yom Kippur War in 1973, the price of a barrel of oil quadrupled in only a couple of months. That kind of artificially-imposed shortage was massively disruptive, but it’s the sort of thing that could be remedied easily. The problem we have now is that almost nothing about this is artificial – it’s taken a decade for the price to quadruple, but here it is. Growing demand from emerging markets will sustain the price hike – Econ 101 again, remember – and as long as the dollar is weak and the price of oil is demarcated in dollars, the cost of oil will be disproportionately high in the United States. So what is to be done? There’s a lot of talk about windfall profits taxation and pursuing speculators, but there’s very little there there. See above about how this has not been a speedy artificially-induced shock. You might nip a little back from ExxonMobil, but not enough to make a material difference. OK, how about ramping up production? If we approved unlimited offshore drilling and opened up ANWR right this second, you wouldn’t see the oil start to flow for almost a decade – and when it did, the material impact on a gallon of gas might be a nickel. For all the hue and cry about it, there’s not some massively huge vat of oil that we could have by Wednesday if it weren’t for those meddling kids pesky environmentalists. Other options – tar sands, oil shale, biodiesel, etc etc – are only commercially viable now because the price of oil is through the roof. These are not things that are going to bring back the days of glorious cheap fuel – they are things that will help keep the current price from exploding, because they will produce more goods to fulfill demand and thus maintain equilibrium. If the price of oil dropped by 25% tomorrow, there would be no point in commercial development of these alternatives, because they wouldn’t be profitable. Face facts, people: you will never again in your life see plain old 87-octane gasoline at $2 a gallon. Hell, you may never see it at $3 a gallon. This price increase is the result of market forces, which means that the price of oil is never going to drop precipitously until demand plummets or supply explodes. Which ain’t gonna happen. In the short term, not much. Everything is planning for the long term. We’re just going to suffer for a few years while we come up with the workaround. In this respect, maybe more drilling seems palatable, but you’re just kicking the can down the road at that point. Things that need to be done: more transit. Problem is, outside an urban environment, it’s tough to push transit – thinking of where I lived growing up, I don’t know that there’s any way a town bus could have been useful, because everyone’s too scattered. The transit solution involves getting it somewhere it could be useful – take Birmingham, for instance, which desperately needs some sort of commuter rail down 280 and 65 between downtown and the white-flight suburbs to the south. In a town with no commuter infrastructure, where an undrained valley means that the wrong sort of weather holds smog in one place for five straight days, the potential improvements in congestion and climate just from cutting rush hour traffic are plentiful. Something else that needs to be done: different vehicles. Here in SiliValley, people are starting to go for the ol’ Vespa scooter in a big way. There are anecdotal tales of families selling one of the his-and-hers Priuses (Prii?) for a Vespa, because the Prius can be sold for exactly what they paid for it and a scooter with double the gas mileage purchased for an order of magnitude less. I know for a fact that I could totally get by on a 150cc scooter for my commute, which would get me at least triple the mileage I get now (although to be honest, it would probably take years and years before the fuel savings would pay for a scooter). People are grasping for old Geo Metros and Honda Civic VX cars from the early 90s that get in the 40s with a plain ol’ gasoline engine. Hell, people are buying the Smart Fortwo out here. I am sure that the VW Polo Bluemotion would go like crazy in urban areas. And then there’s the Chevy Volt, which is not a hybrid so much as it is an electric car with an onboard generator which is completely unconnected with the drive system; it’s just there to charge the battery when it’s not plugged in. The auto industry doesn’t turn on a dime, though, so I suspect it’ll be a couple or three years before that gets retooled. Long story short: we’re going to be here a while. Better start adjusting, because we’re never getting back to normal. This is the new normal. …or does anyone else ever finally show up for Mass after a couple of months, and the homily may as well open with “This is directed specifically at Mr. Stag R. Lee of 72 Whooping Cough Lane, Googleburg, CA, who is married to the tall blond and drives a Rabbit”? In other news, I bought a cell phone. (World stops from shock.) $22 on eBay for a Nokia 1112, which is a bare-bones phone along the lines of my F3. The reason I bought it is because the F3’s battery dies in 48 hours no matter what you do. Even if fully charged and left sitting on a shelf, turned off, the battery will be dead within 2 days. Meanwhile, the 1112 has been on continuously with normal use for almost 24 hours now and hasn’t dropped even one bar of battery off the indicator. (This is pretty damn bare-bones, folks: black-and-white display, NO internet connectivity, NO camera or bluetooth. Places and receives calls, sends and receives texts, has a speakerphone. The two big advantages over the F3 are T9 for texting and timed profiles (the amazing Nokia feature where you can set the phone to stay in silent mode until after the Mass/movie/teleconference/etc is over, at which point it reverts back to normal rather than staying in silent until you remember a day and a half later and realize you missed four calls and half a dozen texts). So yeah, another couple of older phones going into the donate pile. I will probably keep the F3 a while, though, just because it’s a gift – and because it’s the ideal phone to use in distracting young nephews and their peers. 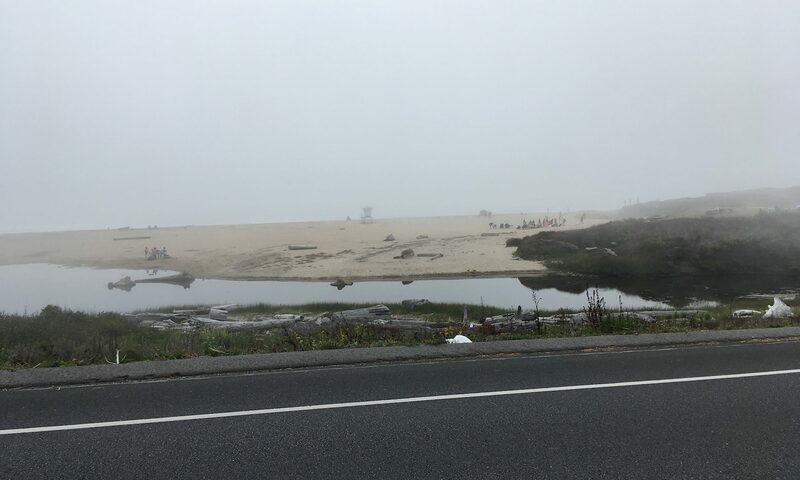 Meanwhile, in proof that God loves us and wants us to be happy, the marine layer has broken back through the Santa Cruz mountains and the temperature is in the low 70s. I never realized how much my mood has always been affected for the worse by heat. No wonder I’ve always been miserable in the summer. The hippies will not bug U-C……. I’m gonna get me a….